These aren’t quotes from a suicide hotline, or a group therapy session. They’re all posts on Reddit, just a few out of the hundreds a day that are made on the dozens of subreddits dedicated to helping people with mental health problems, life crises, or emotional torment. For more people than we can count, Reddit — the same place we house silly memes, AMAs and raucous political commentary — has become their place to open up and receive nonjudgmental support the likes of which they might not receive anywhere else. At first glance, Reddit might seem like an unusual place for the solace-seekers to congregate. Since it’s inception in 2005, Reddit has shot into the upper echelons of most visited websites — it recently beat Facebook into Alexa’s top three — and the size of its community has ballooned out to encompass hundreds of millions of active users. Those users have their choice of, at Reddit’s last count, over 138,000 subreddits in which to gather. Chances are good, if you’ve been online in the past six or seven years, you’ve seen one of Reddit’s more popular subreddits. /r/AMA, or /r/science, /r/technology, or even the infamous subs like (Cthulhu help us) /r/The_Donald. Point being, it’s more often than not a bulletin board or a lightning rod, and not all of it is a place I’d recommend for the helpless and the vulnerable. But there are other subs, buried underneath that surface level, devoted to helping people. It’s in these subs users open the deepest parts of their hearts and minds, and pour out the stuff they only feel comfortable disclosing to a group of like-minded individuals. Subreddits like /r/depression or /r/mentalhealth may not be the most glamorous on the site, and delving into them can feel like reading a person’s diary at times. But the open forum they provide can be extremely helpful for those seeking understanding and advice when it comes to their personal problems. Peer support is far from a new idea — Alcoholics Anonymous, to use one of the most famous examples, began in 1935 with two men from Akron. Support groups appear to be a more recent phenomenon, but are no less entrenched as a method of nonprofessional therapy. 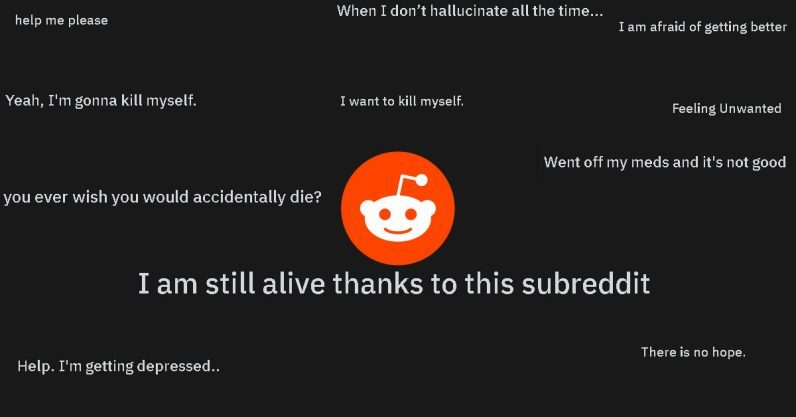 Reddit is also far from the first site to offer online support groups to those suffering from personal or medical problems. In a study published in 2001 as part of the Pew Internet and American Life Project, researchers found evidence suggesting that 28 percent of internet users visited an online support group “for a medical condition or personal problem” — and that’s four years before Reddit was around. But Reddit has a few characteristics which other sites — not to mention other peer support groups — might not have. Being on Reddit is the best place for us because of the large number of users already on the platform. It’s simple to get into and begin to post. According to our statistics, there are users there 24 hours a day, 7 days a week. Reading, posting, and providing support. By having that readily available group of people at all hours, people from all over the world can come and join us anytime they choose. It’s something you can do from the comfort of your home, especially if you have social anxiety, it can be a much more comfortable setting to reach out for help. Going in to see a therapist one-on-one may be too overwhelming for someone. You don’t have to find an online forum which caters to your specific need, because Reddit already has it, and if at any time you feel you need to detach, the aforementioned powerwashing videos are only a few clicks away. There are so many niche things that, if you feel like you’re the only person suffering from something, chances are you can find a subreddit that has thousands of people who are also working through the issue. [Counseling groups] tend to cap off at maybe 12, so even though you might feel a sense of community, it’s not as profound as if you go to a subreddit and there’s hundreds or thousands of people interacting. How much do they help? Reddit, like most online support groups, is a bit of an unknown as far as effectiveness goes. Researchers from The Australian National University in Canberra published a paper in PLOS ONE examining what difference, if any, an internet support group made on those with depressive symptoms. While there was a promising response to online peer support after about six months, the researchers said there was no instant gratification, and further research would be needed (they also noted there was little to begin with). People can say cruel things, and be mean. If you’re on the site, and you don’t have the ability to pick and choose who’s going to respond, and who’s going to shame you for something and make you feel worse, that would be a con. Something like Reddit is not a therapeutic site. On therapeutic sites, there’s often a therapist reading the dialog, or a button you can press that will connect you to emergency services. You don’t see that in subreddits. So if someone is really suicidal, and there are peers trying to help them out, the best you could do is maybe drop a phone number, but the person on the other end maybe doesn’t have access to emergency support. That said, the online community does fill a very real need, even when the help it offers is imperfect. The stigma against asking for help with one’s problems, particularly of the mental or emotional variety, can be extreme. According to a 2016 study by the Royal College of Psychiatrists, only one in five people seek treatment for major depressive disorder — and that’s just in high-income countries. The plus side is just to connect and get advice and support and validation, witnessing of one’s pain and struggle — all those things are crucial for humans. We all need to feel validated, witnessed. We all need compassion, and to be seen authentically. Feeling alone and isolated in your moment of need — regardless of what that need is — is a real problem. The users in a subreddit may not have the professional training most people need, but the site is nonetheless a place where those in need feel as though someone is listening. While we hope Reddit users and other internet denizens continue to support each other, we also encourage everyone to reach out to professionals in their moments of crisis. If you or anyone you know is considering suicide or experiencing intense feelings of anxiety or depression, please call the National Suicide Prevention Lifeline at 1-800-273-8255. For a similar helpline in your country, please visit the International Association for Suicide Prevention. Update: An earlier version of this article incorrectly referred to Hilary Jacobs Hendel as Hilary Jacobs. We’ve corrected this.